Texture is the essential separator between digital media and art IRL. 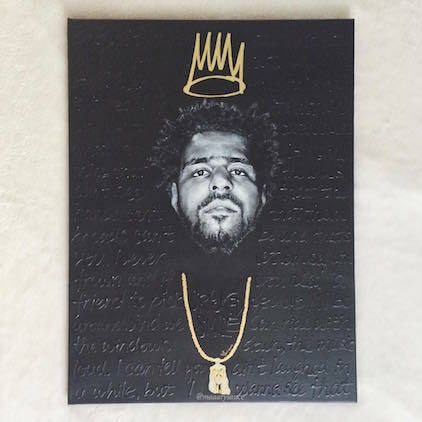 Marianne Patricio (@maaarysauce) cleverly mixes media and uses gold foil on top of portraits of rap artists like Jay Z, Biggie and J. Cole to create a range of dimensional depths. Marianne also pays tribute to J. Cole’s influence in a standout piece that includes lyrics to “Crooked Smile,” shown above. What would rappers be without their gold?